In 2014, the Parks Department requested and received $185,744 from the CPFund to rehabilitate two tennis courts at Swift Park in West Falmouth. 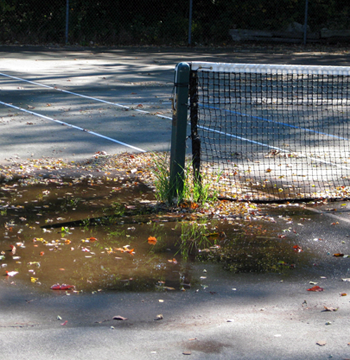 Swift Park tennis courts were badly deteriorated with wide jagged cracks running across the courts and playing lines and standing pools of water after every rain and snow. Effectively, the courts were unplayable, despite the long-time popularity of tennis at Swift Park and more recently pickle ball, which is played on half of a tennis court, allowing more people to play at the same time. Before the conditions worsened, the courts attracted players daily from the spring snow melt until snow covers the ground again in the winter. Frustrated players had asked the Parks Department for several years to rehabilitate the courts. The Parks Department removed the existing courts and features and trees and vegetation, including root systems, to a minimum ten feet beyond the court boundaries. New courts were laid with post-tensioned concrete, which requires no maintenance and comes with a twenty-five-year durability guarantee. Court lines were painted in the spring of 2016 after the winter thaw and the courts were immediately scheduled for tennis and pickle ball into late fall. Swift Park includes a baseball field and a picnic area and small playground for children and families. In 2013, spearheaded by West Falmouth teenager Jake Barry and supported by the West Falmouth Village Association, West Falmouth residents raised the funds to renovate the fifty-year old Swift Park Playground to make it useable again for children and families. The Town donated installation work and West Falmouth held a re-opening celebration at the park in the fall of that year. New tennis courts complete the rehabilitation of the park.